Over nearly 15 years spent studying ticks, Indiana University's Keith Clay has found southern Indiana to be an oasis free from Lyme disease, the condition most associated with these arachnids that are the second most common parasitic disease vector on Earth. He has also seen signs that this low-risk environment is changing, both in Indiana and in other regions of the U.S.
A Distinguished Professor in the IU Bloomington College of Arts and Sciences' Department of Biology, Clay has received support for his research on ticks from over $2.7 million in grants from the National Science Foundation-National Institutes of Health's Ecology and Evolution of Infectious Diseases Program and others. Clay's lab has found relatively few pathogens in southern Indiana ticks that cause common tick-borne diseases compared to the Northeast and states like Wisconsin and Minnesota. But Lyme disease has been detected just a few hours north of the region around Tippecanoe River State Park and Lake Michigan's Indiana Dunes, and Clay said the signs are there that new tick species, and possibly the pathogens they carry, are entering the area. The conclusions are drawn from years of work spent mapping tick boundaries and disease risks, but the exact cause of the shifting borders is not clear. In addition to changing temperatures, Clay references changes in animal populations, including deer, which provide large, mobile hosts for the parasites. Defining these boundaries is critical due to ticks' status as the most important vector for infectious disease in the U.S. In addition to Lyme disease, ticks are responsible for Rocky Mountain spotted fever, southern tick-associated rash illness and a number of other serious diseases. Other conditions, such as mammalian meat allergy, caused by lone star tick bites, are caused by an immune response to proteins in tick saliva. Mammalian meat allergy sufferers experience serious allergic reaction to consuming meat and sometimes other products from mammals. 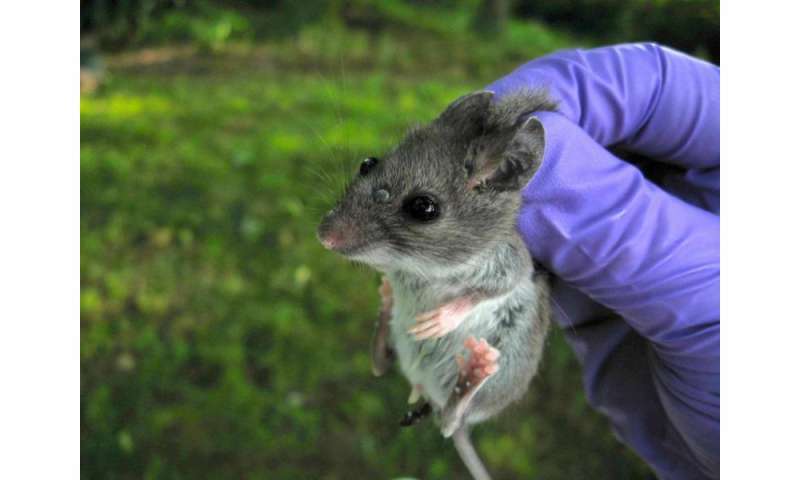 In a paper published in the May issue of the journal Molecular Ecology, Evelyn Rynkiewicz, a former IU doctoral student in Clay's lab and current postdoctoral research fellow at the University of Edinburgh, cataloged the microbiome of two major tick species in southern Indiana—dog ticks and black-legged deer ticks—and of the blood of white-footed mice, the host animal from which the ticks were collected. Another example is the attempt to prevent Chagas disease—a life-threatening tropical illness affecting millions worldwide—by genetically modifying a gut symbiont in their insect vector, the "kissing bug," that suppresses the effect of the parasite that causes the disease. The naturally occurring proximity of harmful pathogens and harmless symbionts in a tick's system could also give rise to new dangers for humans, so it is important to understand the full gamut of microorganisms in their systems. Clay also said better tools are needed to diagnose tick-borne diseases in humans, since the ones doctors use now are poor compared to analyses performed in biology labs. "The medical field doesn't really have a great handle on tick-borne diseases in some ways because the diagnostic tests aren't very accurate," he said. "The lone star tick, for example, carries a pathogen that's closely related to Lyme disease. It's not Lyme disease, but there's a good chance our current tests will turn up positive for it." He said these sorts of diagnostic errors are likely responsible for most Lyme disease cases reported in southern Indiana, as his lab's research has found no evidence of Borellia burgdorferi, the bacterial species responsible for the disease, in ticks captured in their studies. Fortunately, Clay added, the standard antibiotic treatment for tick bites will effectively counter most tick-borne bacterial diseases if caught early enough, no matter the exact diagnosis. But the lack of more precise tests makes tracking tick-borne diseases by region and assessing their true risk to humans more difficult. 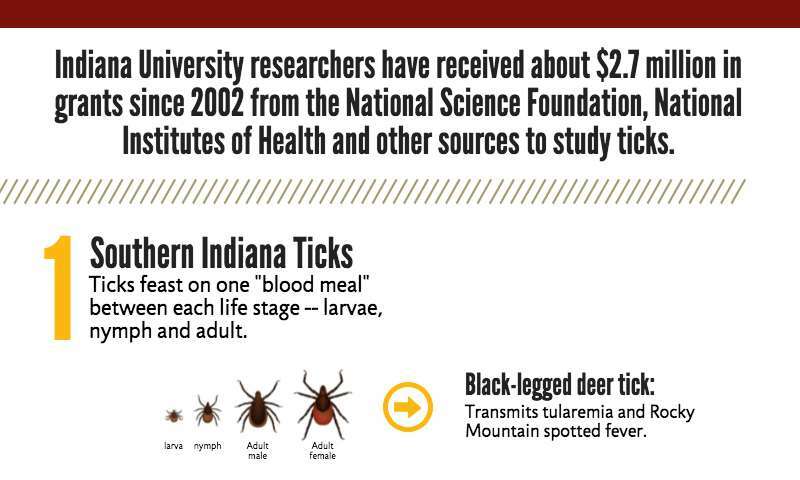 To conduct research, IU scientists venture into the natural environment because ticks are difficult to maintain in the lab. 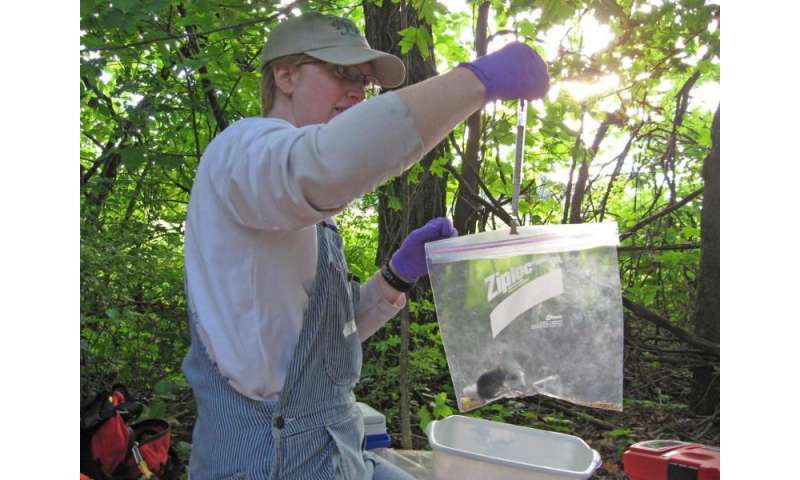 To capture ticks, members of Clay's lab use one of three techniques: "tick drags," small mammal catch and release, and carbon dioxide trapping. The first technique involves dragging a large sheet of white fabric along the ground, tricking the tick into grasping the sheet when it thinks an animal is walking by. White sheets are preferred because dark-colored ticks show up easily against the material. Another method that was used for Rynkiewicz's study involved humanely capturing small animals, such as mice, on which ticks commonly feed. The ticks are collected from the host animals, which are then tagged and released. Over the course of several weeks, scientists will commonly collect multiple ticks from the same animal, with as many as 40 to 50 ticks coming from a single mouse. Tick collections for Rynkiewicz's study took place in two locations within 10 miles of Bloomington, Ind. A third method, carbon dioxide trapping, involves placing dry ice where ticks are common. Ticks use their sensitivity to CO2 to detect host animals, so they flock to dry ice, where scientists then collect them. IU researchers also visit deer kill check stations during hunting season since deer play host to large parasite populations. April and May are typically the worst months for lone star and dog ticks, while black-legged deer ticks are more common in the fall. Clay and his colleagues take every possible precaution to protect themselves from bites. That includes wearing knee-high rubber boots, tucking pant legs into socks, wearing light-colored clothing and using insecticidal sprays. Ticks don't jump, so they normally first attach to a person's legs and can then can crawl to other parts of the body. The IU scientists also advise against wading unprotected into areas where ticks are common, such as grassy, brushy areas or open woodlands. Hikers can avoid exposure by sticking to the center of the trail where grass and other vegetation aren't present. Gardeners typically aren't at risk unless they're working in more rural, scrubby areas. Individuals walking in the woods with dogs should exercise particular caution, Clay added, as pets tend to pull owners off the beaten path and ticks are harder to see in pets' fur. Both dogs and cats should also be treated for ticks. If a person does find a tick on their body, they should remove it immediately. Clay recommends using a "tick nipper" from a local outdoor store, or regular tweezers, using a firm grasp at the point where the tick's mouthparts are embedded in the skin. To remove the tick, pull directly upward perpendicular to the skin with a slow steady force until the tick pulls free, then clean the spot with alcohol and apply antibiotic cream. Don't grasp too tightly as you want to avoid squashing the tick before it's removed. The most important rule in tick safety, he said, is vigilance. Always check the backs of legs and other areas you can't easily see, and never get into a car without checking for ticks. "Fortunately, it takes a while for ticks to transmit pathogens," Rynkiewicz added. "They stay attached a few days, but if you get them off right away, your chances of picking something up are very low."